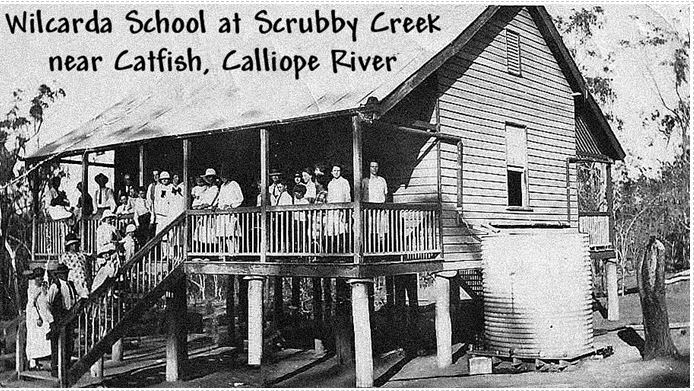 The Wilcarda School was located at Scrubby Creek near Catfish on the Calliope River. The Catfish Inn was built less than a mile from Commodilly, on the corner near the Galloway Plains turn-off. This was on the track that coaches and drays used when travelling from Gladstone to Banana and further afield. This was a stopping point for coaches where they changed horses and their weary passengers could refresh at the Inn. About two kilometres from Commodilly was the dense Catfish Scrub, which was difficult for coaches to negotiate in the old days, particularly if they had to pass coming in opposite directions. Wilson and McDouall from Calliope Station cleared a large area of the Catfish Scrub when beef prices were low in 1910 and started dairying. This area became known as Wilcarda and Calliope Station started dry-land cotton growing on a big scale along with the dairying. By 1925 the drought had beat them and while they failed with cotton many families moved into the area changing to different types of agriculture. 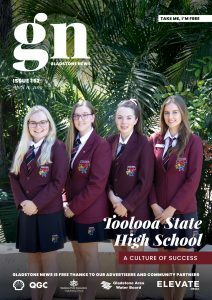 The Clyde Creek School near Gladstone had closed by this time was shifted to Scrubby Creek, opening as the Wilcarda School in 1926 with thirty pupils.